Eggnog is a holiday classic and it is a favorite party drink when the Christmas season rolls around each year. While there are many ways to make eggnog, few recipes are as traditional as this one which features brandy and fresh eggs. Made-from-scratch eggnog is far superior to any ready-to-drink, just-add-booze options you can buy at the supermarket. It is also easier than many people have been led to believe. If you know how to beat eggs and have a basic stock of kitchen essentials, you can make great eggnog. This is a perfect recipe for larger parties and it is one that has been enjoyed by revelers for centuries. Though it does require a bit of patience and time (no more than those baked goodies you whip up), it is well worth the effort and sure to be a crowd-pleaser. Beat the egg yolks, 1/4 cup of the sugar, salt, vanilla, and nutmeg (if using) together until it is very thick and has a light yellow color. Gradually beat in the remaining 1/4 cup sugar and beat this mixture to soft peaks again, creating a meringue-like cream. Serve the eggnog in a mug, Irish coffee glass, or punch cup and grate nutmeg over the top for a garnish. Choose your booze. While brandy is a favorite and one of the more traditional liquors used in eggnog, it is not the only option. Rum and whiskey are also popular alternatives. However, in a taste test, brandy does make a more appealing eggnog overall. Make sure you're using the freshest eggs. Everyone has heard the warnings about drinking raw eggs and the potential for salmonella. Yet, you don't have to let that scare you away from this Christmas classic. With proper attention to the freshness and quality of your eggs and how you handle them, your eggnog should be perfectly safe for guests. Eggnog is one of those drinks that people either love or hate and many people fall into the latter category. 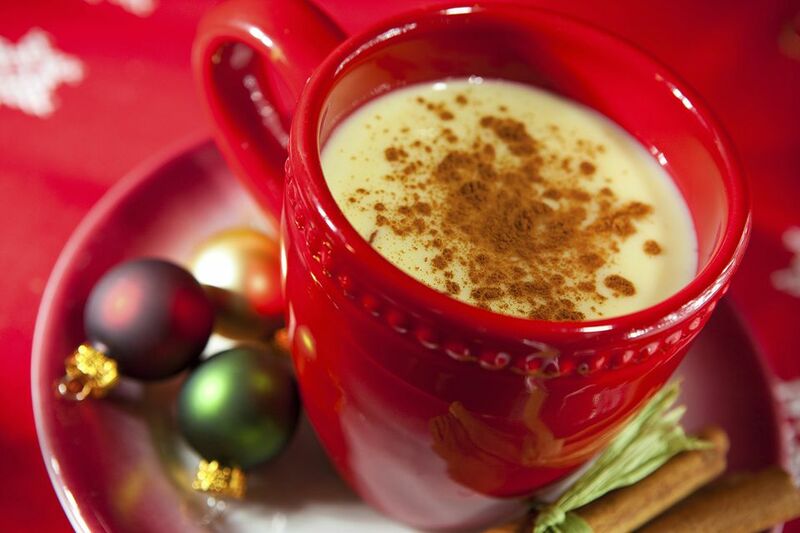 If you are one of those haters, explore the many eggnog recipes that are available. It is quite possible that you have not yet found the 'nog that's right for you. For a gentle introduction to the world of eggnog, try a recipe with sweeter flavors and a little spice to cover up the egginess. Recipes like gingerbread eggnog and toffee eggnog will quickly change your mind about eggnog. If you want to avoid eggs in your nog, that's possible too. Whip up a vegan eggnog or Puerto Rico's coquito, which prefers coconut and milk over eggs. Eggnog also has a reputation for being too strong and it has been known to get more than a few holiday party guests, well, schnockered. In most cases, this is because the drink has too much liquor thanks to a "generous" host. This is never the best idea for punch-style drinks because your guests don't know how potent it is. It's easy for them to have one glass too many with buffoonery and general embarrassment to follow. In this recipe, the two cups of brandy are perfect when serving about 16 small glasses of eggnog. With an 80-proof brandy, it works up to around 18 percent ABV (36 proof), which is about average for a good cocktail. Besides, most people will only have one or two glasses before turning to another drink because you can only have so much nog!